Ever feel heavy? You look in the mirror and see someone weighed down and decide you’re going to lose some weight. So you start counting calories and upping your exercise routine, but what’s holding you down doesn’t seem to loosen. Or maybe you decide you’ll get organized. That’s all you need. A new app or fresh notebook to make your latest check-list in. You’ll clean the house too while you’re at it. Purge you life until everything is neat and orderly with no excess clutter laying around. Then you’ll be able to breathe. Great ideas, but will they really work against what’s pressing on you? And did you know your worth has nothing to do with your ability to handle these things? Because that job isn't yours. Now, don’t get me wrong. I know we need to take good care of these lives God has blessed us with. I am all about that, but simply maintaining a healthy lifestyle is not what I'm talking about. 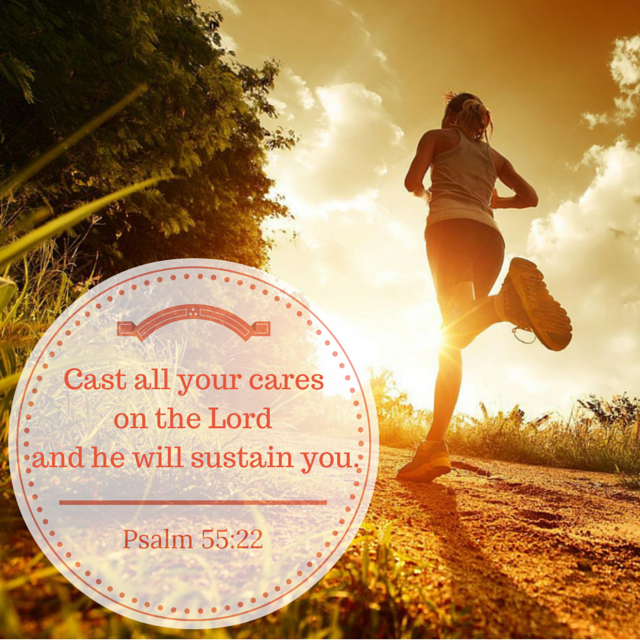 When the heaviness we're trying to relieve has nothing to do with the out-of-control areas or the extra pounds on our middle, and everything to do with the emotional weight we hold on to, then that burden is God's to manage. When that’s the case, we can run our laps or race on the elliptical. Change our diet to all things green and nothing sweet. We can clean till our fingers bleed and create gorgeous to-do lists with everything checked off. But the true weight we’re carrying won’t drop until we stand in the presence of the only One big enough to shoulder it and then hand it all over to him. You spiritual muscles were never meant to bench press your emotional scars. No matter how much you grow, that job is God’s and God’s alone. Not being able to lift it doesn't mean you're a failure, it means you need to let it go. Don’t you think it’s time to hand that weight to him? Dear Lord, today I hand you all the extra weight I’ve been trying to carry. I am quaking underneath it. I am tired and ready to rest, so I give you all my cares. All my hurts. All my anger. I ask you to shoulder it for me and trust you to handle it all. Help me find respite today, Lord, in you and you alone. Picture what’s weighing you down today as a barbell (50 lbs., 100 lbs., 200+ lbs?) that you hand over to God. Don’t just let him be your spotter, let him hold it for you. He won’t break a sweat, and you can rest. Nice post, Susan. I've been sharing a burden with God the last couple of days, and your post touched me. Thanks!